Each conic section has its own standard form of an equation with x- and y-variables that you can graph on the coordinate plane. You can write the equation of a conic section if you are given key points on the graph. You can alter the shape of each of these graphs in various ways, but the general graph shapes still remain true to the type of curve that they are. Cutting the right cone with a plane to get conic sections. 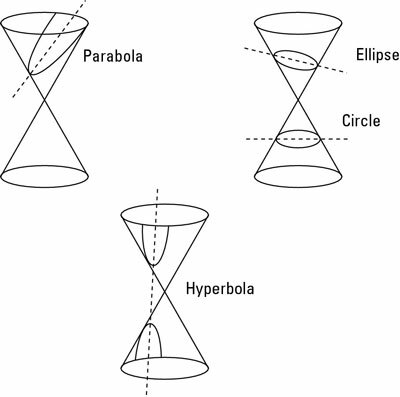 This figure illustrates how a plane intersects the cone (the top and bottom half are considered two halves of one cone) to create the conic sections, and the following list explains the figure. Circle: A circle is the set of all points that are a given distance (the radius, r) from a given point (the center). To get a circle from the right cone, the plane slices occurs horizontally through either the top or bottom half of the cone. Parabola: A parabola is a curve in which every point is equidistant from one point (the focus) and a line (the directrix). It looks a lot like the letter U, although it may be upside down or sideways. To form a parabola, the plane slices through parallel to the side of the right cone). Hyperbola: A hyperbola is the set of points where the difference of the distances between two points is constant. The shape of the hyperbola is difficult to describe without a picture, but it looks visually like two parabolas (although they’re very different mathematically) mirroring one another with some space between them. To get a hyperbola, the plane must slice through the right cone and a steep enough angle where it is slicing through both halves of the cone. Most of the time, sketching a conic is not enough. Each conic section has its own set of information that you usually have to give to supplement the graph. You have to indicate where the center, vertices, major and minor axes, and foci are located. Often, this information is more important than the graph itself. Besides, knowing all this valuable info helps you sketch the graph more accurately than you could without it.